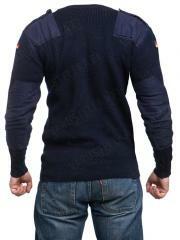 Navy blue German sweaters in used condition. Probably the best model around, even including the classic British jumper. 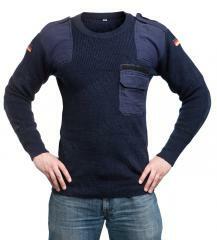 Made of heavyish wool, with elbow reinforcements, epaulettes and a small pocket on the breast. 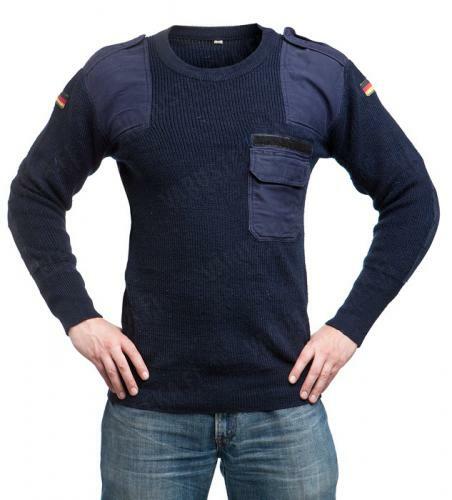 All sweaters have German flags on the sleeves. This model has been in use since the Cold War, but it's so good (and warm) that it's still good today. To the best of our knowledge, the model is still in use by the Bundesmarine. Made of wool, wash in 30 degrees Celsius. Sizes in standard men's Euro sizes (user's recommended chest circumference in centimetres, divided by two). Divide by 2,54 to get inches. Used, but OK and serviceable. Cotton parts might be a bit faded and such, but otherwise they look good. ja kuitenkin lämmin ja mukava. Brittivillapaita vertailukohtana on kyllä tyylikäs, mutta helposti epämukavan tiukka. Tänään posti toi 52 koon. Ajattelin että sopiva, mutta 182cm/92kg ,rinnanympärys 102cm oli liian pieni paidalle. Ei auttanut paskamahakaan tilannetta, kokeillaan nyt sitten laittaa 46 ja 48 tilaukseen, jätetään tarkoituksella 50 pois. Tuskin 52 ja 50 ero on järin suuri. Pitää postata uudestaan miten ne istuu jahka kolahtaa postiin . Edit : On tämä toimitus nopeus melkoista. Tänään 14.12 tuli koot 46 ja 48. 48 oli nyt se joka sopi minulle , ei tiukka , ei väljä. 46 puristi jo liikaa ja paidan helma ei peittänyt röllimahaa. Kiitos!! Paidasta näkee että on käytetty, mutta on täysin ehjä.. ja hyvä! 176cm, rinnanympärys 101cm ja koko 50 oli itselleni sopiva, aika lailla ihon myötäinen, mutta ei tarvitse vetää päälle kuin makkaran kuorta. Hurjan lämmin ja mukavan tuntuinen villapaita, istuu mukavasti päälle. Hihat on vähät pitkät itselle kun on lyhyet käsivarret mutta hihoja voi vähän taittaa. Hyväkuntoinenkin vielä. 5/5. Ordered a size 58 for my 116 cm chest. Received a sweater that must've been either mislabeled or worn by the most barrelchested person to ever enlist in the bundesmarine. I measured the chest circumference of my sweater to 160 cm, which is probably something "The Mountain" from Game of Thrones could wear... I washed the sweater in 95°C and tumble dried it which is usually a big no-no with wool, but that got it down to an approximate size 58-60. The wool parts of the sweater arrived (and are still) in great condition, but the cotton parts are faded and there are some holes in the elbow parts. The wool is Shurwolle which seems like a non-itchy kind. Ordered a size 44, it fits perfectly. The one i got must have been unissued, no signs of wearin it at all. Looks good and durable but it's HUGE!! Maybe it was meant to be worn over body armor or a backpack or by ninja turtles. I should have ordered maybe two sizes smaller. My chest size is 88 cm and I ordered the size 44 sweater--it fits but it's not as close as shown in the model photos--it might be worth going down one notch from your recommended size. My suspicion is that the previous user was larger than me and the continuous use fitted the sweater to his body. The material is 80% wool and 20% polyamid. Recived mine in a somewhat faded collor and rubbed off reinforcements at the shoulders. Sadly, bevore handing it back, the previous user recived a haircut in this pullover. furthermore, this Obergefreiter left his insignia on the epaulettes and a whole forest in the chest pocket. But cleaning it out was not as complicated as thought. 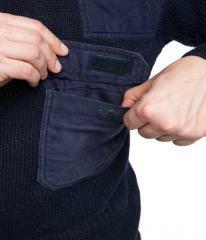 simply brushing out the pocket and using a lint roller solved this problems. Now, i have a stylish, warm, comfy and storrytelling pullover at home. Oh, and I think, the size does fitt somewhat well... a bit worn out for sure, but who wants a skin tight pullover annyways? Aivan huippu paita. Ja sairaan nopee toimitus!